“Meet the Mormons,” an 80 minute documentary-style film profiling the lives of six Mormons around the globe, opened in theaters nationwide on October 10. The film premiered with great fanfare on Oct. 7 in Sandy, Utah, with 500 invited guests including LDS church leadership, the six individuals profiled in the film and their families, Mitt Romney, Marie Osmond, and comedian Jenna Kim Jones, who narrates the film. Box office returns have been strong: the film had a strong opening weekend despite being on just 317 screens, placed in the top 10 films in its first week, and had the highest weekly per-screen average. To date it has earned $5.5 million altogether, putting it 37th on the list of highest-grossing documentaries; all of the film’s proceeds will go to the Red Cross. Commissioned by the leadership of the Church of Jesus Christ of Latter-day Saints and initially intended to be shown at the Legacy Theater in Temple Square and LDS visitors’ centers around the world, the film’s early screenings in front of test audiences convinced church leaders to rethink its purpose. “After watching the film, our test audiences were more likely to consider us as Christian, understand more clearly the correct name of the Church, and be more respectful,” said Elder Jeffrey Holland in a video message addressed to LDS members. “Having never seen results like this before, we were determined to make it more broadly available.” The film was timed to open for national theatrical release the weekend after General Conference. According to Holland, the purpose of the film was “to increase understanding, not an effort to proselytize.” “We simply want as many people as possible to see this film,” Holland said. 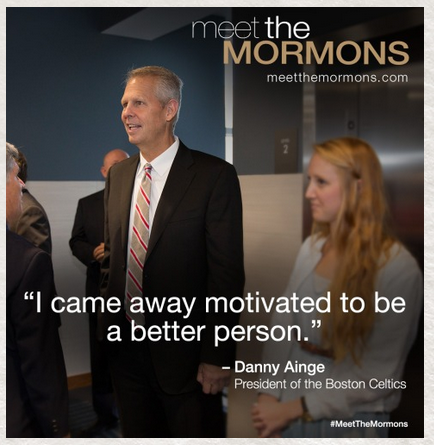 “Meet the Mormons” should be contextualized as part of a larger series of official LDS media initiatives designed to promote the church by featuring a message of authenticity via individual, “real-life” stories. Those looking for cameos by church leaders, explanations of doctrine, or evidence for historical claims will not find them; instead, like more recent campaigns like Mormon Messages and the “I’m a Mormon” campaign, “Meet the Mormons” employs an individual, story-based approach to reach out to mass audiences. In the “I’m a Mormon” videos, individual men and women tell their stories of overcoming obstacles and achieving great things against a backdrop of global diversity and brightly colored backgrounds. The focus is on the individual and the story; the phrase “I’m a Mormon” functions as the reveal at the end. “Meet the Mormons” director Blair Treu said that church leaders gave him no directives on who, where, and what to shoot for the film, saying: “Their only charge was to be authentic and real.” In the film this theme of authenticity is expressed in two related ways: first, the film directly identifies media misconceptions, and second, it juxtaposes them with the real-life stories of a diverse group of real Mormons from around the world. The film opens with narrator Jenna Kim Jones, Daily Show alum, interviewing passersby in Times Square about their misconceptions about Mormons, interspersed with clips from television shows and films like The Simpsons, 30 Rock, and South Park (but not that South Park episode nor, notably, The Book of Mormon musical). Popular media contributes to these stereotypes, the film implies; it asks us to decide for ourselves what Mormons are “really like.” The scene then shifts, with soaring music and panoramic landscapes, to its six individual stories: Jermaine Sullivan, an African American bishop (now stake president) in Atlanta; Col. Gail Halvorsen, the Berlin Airlift “candy bomber”; Dawn Armstrong, a Utah “missionary mom” preparing to send her eldest son on a mission; Bishnu Adhikari, an engineer overseeing several development and humanitarian projects in his native Nepal; Carolina Muñoz Marin, a Costa Rican wife and mother who is also an accomplished martial arts fighter; and U.S. Naval Academy head football coach Ken Niumatalolo. The film tries to identify common ground with non-LDS audiences in emphasizing the power of an individual story, along with the importance of family and service. Jones’ own website features at the top the eye-catching self-identification “Jenna Kim Jones . . . is a real Mormon. (She’s also a writer and comedian. )” Like Jones, the individuals featured in the film are “real Mormons,” but they are also many other things: husbands, wives, mothers, fathers, academic advisors, fighters, football coaches, pilots, humanitarians. Each individual’s commitments to service and family, and to the common ground that those provide, are highlighted. But for critics, the authenticity of the film is precisely what’s in question. As with many religious films, audience reviews of “Meet the Mormons” differ strikingly from those of movie critics, who have largely panned it: Rotten Tomatoes shows 8 out of 9 critics giving it negative reviews while the audience rating is 92%. Jana Riess provided a roundup of “mixed” early reviews of the film, while critic Roger Moore called it “a wholesome, sugar-coated recruiting film,” and HuffPost deemed it “an 80 minute infomercial” and “slick, corporate PR.” Sean Means in the Salt Lake Tribune was not too much kinder, noting that although Treu “finds small moments of authentic grace and humanity in each” story, the film is “not a documentary but an informercial, meant less to inform than to introduce a sales pitch.” Likewise, Robert Kirby in the Tribune calls it more “a showcase of Mormon wholesomeness than a candid look at the real us.” The film doesn’t address controversies in the Church over race or gender roles or doctrine or history; it doesn’t promote “religious literacy” by educating viewers about the uniqueness of LDS history or theology. 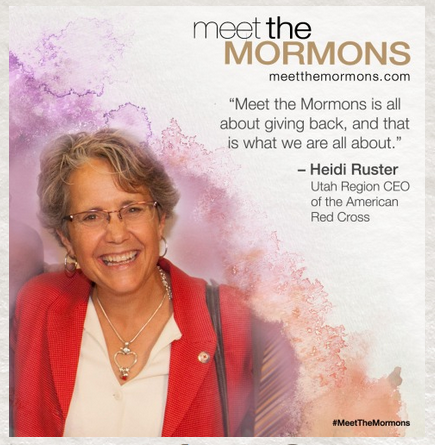 And although at least four out of the six people profiled in the film are converts to the faith, the film also “chose not to use conversion stories” because the film’s message, according to Treu, is that “real Mormons” are, fundamentally, “not different from you. We want to find common ground and build bridges of understanding.” Indeed Bishnu, the Nepali engineer, and Carolina, the Costa Rican martial arts fighter, both converted to Mormonism as a result of their interactions with LDS missionaries. The film takes pains to address any possible negative family or cultural fallout of these decisions by assuring us, via interviews with their parents and images of happy extended family gatherings, that Bishnu’s and Carolina’s families and local communities are fully supportive of their choices. In “Meet the Mormons,” the LDS Church itself as institution, authority, and arbiter of doctrine is deemphasized in comparison to the selected individual members and their life stories. It’s not that it is absent; we see each of these individuals attending services and church functions, interacting with missionaries, serving important leadership roles in the church, instructing children, reading the Book of Mormon. It’s just not part of this particular message of authenticity and realness. The film wants to challenge our preconceptions not only about Mormons, but also about films: “This is not a movie about sports; it’s about defying the odds. This is not a movie about war; it’s about changing the world. This is not a movie about theology; it’s a movie about faith,” the official trailer, which has been viewed 115,000 times, proclaims. But according to film critic Means, a good movie, whether it’s a religious one or not, “has to be able to tell a story, not just deliver a message.” “Meet the Mormons” tries to deliver a single message about the church via six individual stories. It’s a “real movie,” all right, as Holland repeatedly emphasizes in his video introduction to the film, one that everyone can go see in local theaters, but the question at stake in responses to “Meet the Mormons” seems to be whether it’s an authentic one.